The Strawhecker Group (TSG) is pleased to announce its role as exclusive payments industry consultant to Corporate Finance Associates (CFA), in support of Shift4’s Acquisition by Lighthouse Network. 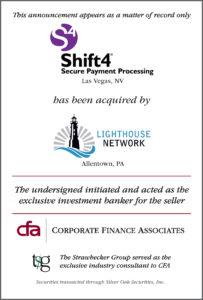 On November 30, 2017, Shift4 was acquired by Lighthouse Network in a private transaction. The terms were not disclosed. Financial representation was provided by the Omaha Office of Corporate Finance Associates, led by Jim Zipursky. “We were honored to work with the Oder family as they looked to find the right acquirer for Shift4, the company they founded and built into the premier payment gateway. Under the leadership of Jared Isaacman, Lighthouse Network and Shift4 are certain to be the leader in the electronic payments/financial technology industry,” said Mr. Zipursky when asked about the transaction. TSG, the leading expert in the electronic payments industry, provided CFA with industry consulting in the transaction. “The sale of Shift4 highlights a key example of TSG’s expertise. Our firm has its pulse on leading payment offerings and recognized the synergies between Shift4 and Lighthouse Network, especially from a technology perspective,” added Jamie Savant, Co-Founder and Partner at TSG. TSG has a proven track record in the transaction advisory space, having completed more than 200 valuations on payments companies in the last decade. Additionally, TSG has provided transaction support to firms that have ranged in scale from $3M to $3B+ in transaction assessed value – see recent deals.